Play parachutes are great to develop the trust and coordination skills as well as getting children active and having fun! Try bouncing balls and bean bags on the parachute to enhance the fun. Ideal for kid’s parties, family fun, nurseries, primary schools and special needs groups or even a picnic mat! Can be used indoor (large rooms and halls) and for outdoor fun. 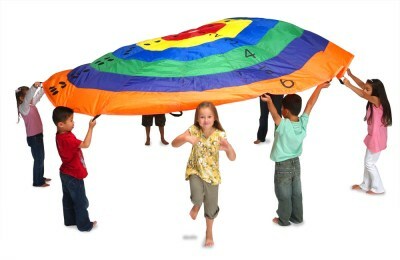 This play parachute is made from lightweight yet durable heavy duty wipe clean polyester. Free carry bag included for easy storage and transportation. A very versatile product that can not only be used in the traditional way like other play parachutes but doubles up as a giant floor target. This makes an ideal floor target for many different outdoor games such as frisbee and many other possible games, with each colour scoring points with the higher value towards the centre. Includes 8 strong handles sewn in along the edge, one handle per child.